FINALLY, here are my Tasting Box comparisons! The Foodzie Box vs. the "Drewzie box" (the box that my friend Drew gave me). Drew went to Wegmans and spent 20-hard-earned-dollars on me just to prove a point :) So, who won? Let's see. Truffled Popcorn - NO! Too much truffle flavor (is that terrible to say on a food blog?)! Sweet and Spicy Candied Walnuts - Noooooo, did NOT like these. I can't place what it was about them, but it was just a big NO for me. Fleur de Sel & Beer and Pretzel Caramels - The beer and pretzel caramels were sooo not my kind of thing (but they are apparently a bestseller), but the Fleur de Sel one was great. Parisian Mendiants - These are small disks of chocolate with candied orange, hazelnuts and pistachios. These look very pretty and were tasty, too! Almond chocolate Trail Bar - AMAZING. It was also perfect fuel for a run! It contained rolled oats, almonds, nutty rice, flax seeds, coconut and chocolate. And there was no skimping on the chocolate. Unfortunately, if I wanted to buy them online they are $50 FOR 18 BARS. $50!!!!!! Cabernet Brownies - These were made with wine flour - isn't that cool? OMG they were sooo good and fudgy. Regular and Dark Chocolate Cocomels - Coconut milk caramels! So good! Chile Pepper and Sumac Pepper Salts - Interesting idea. I like that it came with recipe cards, but I still haven't used them. Blue Cheese Fig Savory Shortbreads - LOVED them, and I don't even like blue cheese. Made for a red wine pairing which is a super cute idea! Hot Chocolate on a Stick - Cute concept, but totally annoying to actually use since it took SO LONG to melt. It did make AMAZING hot chocolate though. Gogi Berry & Himalyan Sea Salt Dark Chocolate Bar - Saving this and am really excited to try it! Cranberry and Fig Sauce - This was definitely more of a chutney than a jam (which is what I was initially expecting). It was great on sandwiches! Seitenbacher Muesli (For Active People) - BEST MUESLI IN THE WORLD. Went to Wegmans and bought two more bags. Need to buy more! I'm not sure I can eat any other kind!!!! Pretzel Crisps - YUM! And I'm not even a big fan of pretzels. Went to Sam's Club and bought a HUUUUGE bag of these. Love them plain, love them with cheese, love them with hummus etc etc etc ! Pumpkin Seed Cheddar Crackers - Interesting flavor, and I liked them with cheese as well but they were VERY crunchy. I was worried for my teeth. Hyderabad Vegetable Pilaf - WAY too oily and spicy. Dislike!!! So who do I think was the winner? Welll......AND YOU WILL HATE ME FOR THIS: BOTH!!!! OK, here is why. The Drewzie Box wins because I bought more of the items for myself - so it did super well on New Customer Acquisition (I have friends in the business world who told me that phrase hahaha). I've now had THREE Foodzie boxes, and never once did I ever feel the need to go online and buy the full-size products from Foodzie. But the Foodzie Tasting Box wins on originality. It has definitely opened up my taste buds to things I had never tried before (Coconut milk caramels! Kale chips! Brownies made with wine flour! ), even if I didn't end up liking them (Kale chips!) I think that $20 towards a fun surprise bag of treats is worth it. I don't have a yearly subscription though, I think it will be a once in a while treat. 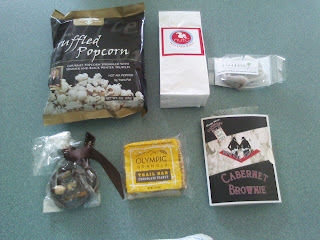 Disclaimer - The February food box was sent to me for free by Foodzie, but I purchased the box for January and March. Drewzie's box was also free!